New Zealand powerhouse Annabel Anderson after winning the Women’s SUP Distance Race in Copenhagen. New Zealand’s Annabel Anderson, Australia’s Jordan Mercer, Hungary’s Bruno Hasulyo, and Australia’s Lachie Lansdown emerge victorious in epic 18 km Distance Races. ATTENTION MEDIA: For daily photos, video highlights and video news releases, click here. To see the full results, click here. 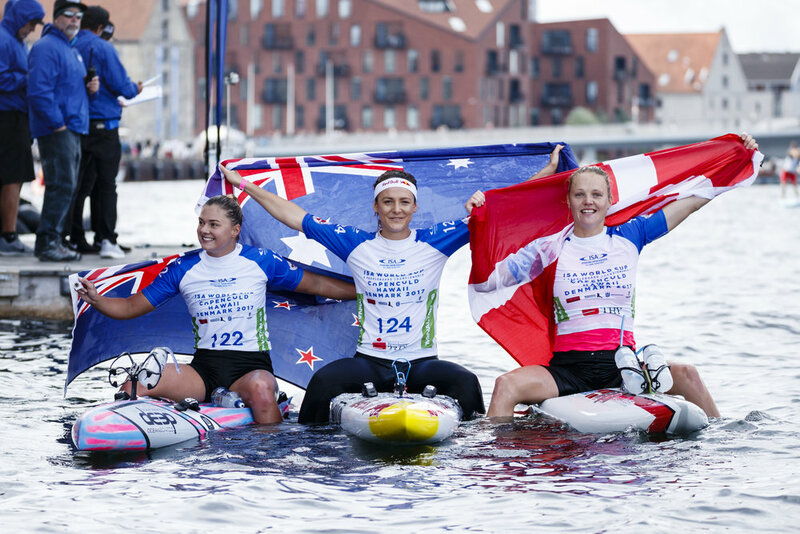 New Zealand powerhouse Annabel Anderson dominated the Women’s SUP Distance Race while Australian veteran Jordan Mercer overcame personal adversity to win the Women’s Paddleboard Race in race that went down to the wire. On the men’s side, Hungary’s Bruno Hasulyo, put on a stunning display of SUP racing to become a first-time ISA World Champion on the Men’s Distance Race, while Australia’s Lachie Lansdown overcame last year’s winner, Sam Shepard to win his second ISA World Title. Hungary’s Bruno Hasulyo, put on a stunning display of SUP racing to become a first-time ISA World Champion on the Men’s Distance Race. The Women’s SUP Distance Race was first to take off in the morning. After 30 minutes into the race Anderson established a lead that would only grow as the race went on. Anderson earned the Gold Medal with a commanding lead ahead of the respective Silver and Bronze Medalists, Sonni Honscheid (GER) and Olivia Piana (FRA). USA’s Fiona Wylde rounded out the podium in the Copper Medal position. The Women’s Paddleboard Distance Race took off next and was fiercely contested from start to finish. The 8-time ISA Gold Medalist Jordan Mercer from Australia jumped out into the lead pack of paddlers, strategically drafting behind to conserve energy. The favorite Mercer was never able to break from the pack, and even trailed for moments on the final lap behind the local Danish paddler Katrine Zinck. After 18 grueling kilometers around the Copenhagen Harbor, the race came down to a sprint on the final stretch. Mercer was able to find an extra reserve of energy and pull ahead by less than a board length to take the win. New Zealand’s Jessica Miller and Denmark’s Katrine Zinck joined Mercer in the all-out sprint and finished respectively with the Silver and Bronze Medals, with Zinck notably earning the first ISA Medal ever for a Danish woman. From left New Zealand’s Jessica Miller, Jordan Mercer from Australia and Denmark’s Katrine Zinck. Mercer let her emotions out and expressed her pride after winning her ninth individual ISA Gold Medal. “Just last night my board arrived at the airport and we discovered that there was a huge crease in it. My teammates along with friends from other competing nations stayed up late last night fixing. The first time I saw my board was this morning before the race and I just had faith that things would go my way. “To paddle for 20km and come down to a sprint finish is the toughest way to have a race go so I knew I had to be really technical and be smart, but you really want to try to push as many girls back as you can. The Men’s SUP and Paddleboard Distance Races followed the women in the afternoon, with the SUP men getting off to a quick start out of the gates. The Hungarian brother duo, Bruno and Daniel Hasulyo, set the pace along with SUP superstar Connor Baxter from Hawaii. On the third of four laps Baxter made a move to pull away from the group, but the lead was short lived as Bruno Hasulyo was able to close the gap. Baxter and Hasulyo exchanged leads until the final buoy turn where Baxter fumbled his footing, allowing Hasulyo to build a solid 10-meter lead. Hasulyo powered through the finish line, earning Hungary’s first Gold Medal in their country’s first appearance in the event. Bruno Hasulyo’s brother, Daniel, came across the finish line behind Baxter with the Bronze Medal, historically placing another Hungarian on the podium. Baxter’s teammate, Mo Freitas took the Copper Medal, adding another medal for Team Hawaii in their pursuit of the overall Team Gold. Bruno Hasulyo exploded with joy after earning a medal alongside his brother. “I've been training so hard for this every day for the last two years this was the main goal in front of me, so I am speechless. I couldn't be happier! Finishing off the day of competition was the Men’s Paddleboard Distance Race, keeping the energy level high with another photo finish. The 2016 Gold Medalist, Sam Shergold (NZL) and the 2015 Gold Medalist, Lachie Lansdown (AUS), asserted themselves as the leaders from the beginning and went neck and neck to the end. Lansdown and Shergold sprinted through the finish, with Lansdown edging out the win by less than half a board length. ISA President, Fernando Aguerre chimed in on the historic day of competition. “Today was a day of firsts at the 2017 ISA World SUP and Paddleboard Championship. In the first day of the first ISA event ever held in Denmark and the first ISA SUP Worlds in Europe, we saw our first Danish woman win a medal and also our first land-locked nation taking a SUP Gold medal. The ISA has been the only international federation truly developing SUP. Seeing two medals from Hungary in their first year in the ISA Worlds speaks clearly ilLustrates our commitment to the development of SUP racing and surfing all around the world, even in countries without access to an ocean.